On Twitter, someone asked about a suitable RPG for running games set in the world of “The Persuaders”, an action adventure series with Tony Curtis and Roger Moore, one of many from production company ITC, some serious, some, like this, with comedic elements. I immediately thought of Crooked Dice Studio’s 7TV, a skirmish wargame set up to have heroes and villains battle in scenarios of the sort to be found in programmes like “The Champions”, “Jason King”, “UFO” with a side order of Bond. The system was originally created for a free set of Doctor Who miniature rules but, with Warlord having obtained that licence, the free set seems to have gone. There are still a couple of bits of Doctor Who still in the rules. These are, as I said, wargame’s rules, for a skirmish game, so why would I point someone to this as the start of trying to run an RPG. For a start off, and never mind that skirmish wargames are the start of RPG systems, the 7TV rulebook is choc full of references to the inspirational source material in the form of script excerpts and “Radio Times” style TV Listings with programme and people names that are obviously lightly changed from the originals, write “Ken Troy-Martin” instead of “Troy Kennedy Martin” or “Department X” instead of “Department S”, that sort of thing. 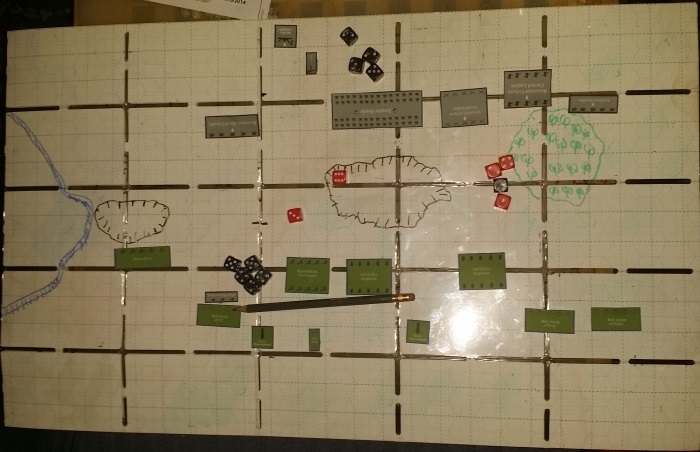 The wargame scenarios are designed to be created with themes from the shows, which makes them a useful way to set up the framework of an RPG adventure and sets of linked episodes are part of the game. Add to that both the synopsises of the fake TV programme listings and the wealth of the real, original TV to mine for inspiration and any GM has a lot to work with in terms of framing adventures. Characters, both heroes and villains, are made up of archetypes, with special abilities, with, of course, a few background extras to make up the numbers. Their profiles are not just combat stats, they have intelligence and can have special abilities. Tests of their statistics can be modded into a skill system, add a few skills to give boosts to chances to succeed, though the resolution system might be a bit too gritty, being based on a single d6. The game has “Audience Appreciation” as a balancing mechanic for the side that loses initiative in combat, that could be changed into a Fate Point like system for dice boosts/re-rolls, for aiding allies or summoning extras to aid you. 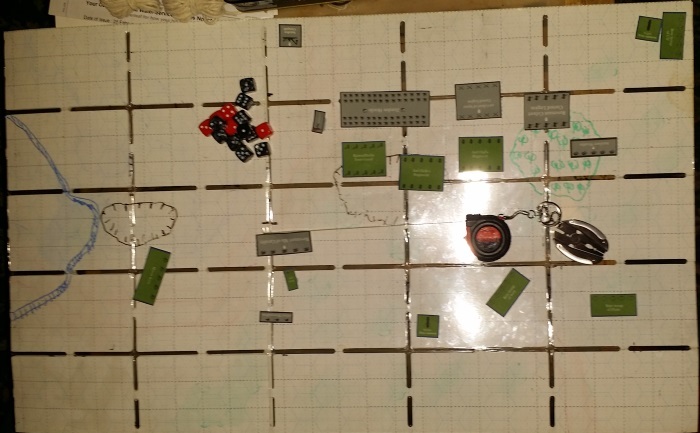 For a few years now, thanks to dedicated writers and easier routes to publishing, there have been nostalgic attempts to recapture the *feel* of older role-playing games, mostly “Dungeons and Dragons” using either the OGL d20 system or a house system. I have argued that, to me, Dungeons and Dragons 5th edition is itself a retroclone,an attempt to recapture it’s earlier, simpler self, after the excesses of 3rd and 4th editions. This is not a new thing though. Another game from the start of the hobby had a larger edition attempt to recapture something of an earlier edition. 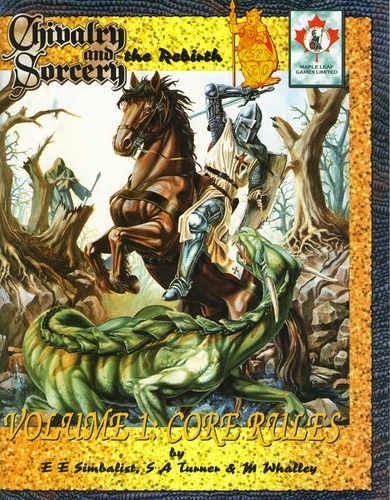 That was 2000’s “Chivalry and Sorcery: The Rebirth” aka 4th edition. That attempted to marry the new system introduced in 3rd edition with the feel of 2nd edition. Second edition C&S had potential to be something else, something great enough to wrest focus away from the behemoth that was 1st edition, and I think it should be celebrated more. Firstly, a bit of history. When D&D first come out, in its 3 books in a box, people saw it was not perfect and started to tinker with it.The magic system and the combat system were frequently “house-ruled”. People also had an appetite for a premade world, which seems to have surprised Gary Gygax, who seems to have enjoyed making his own and seen that as part of the game. Into this enter two Canadians, Ed Simbalist & Wilf Backhaus. 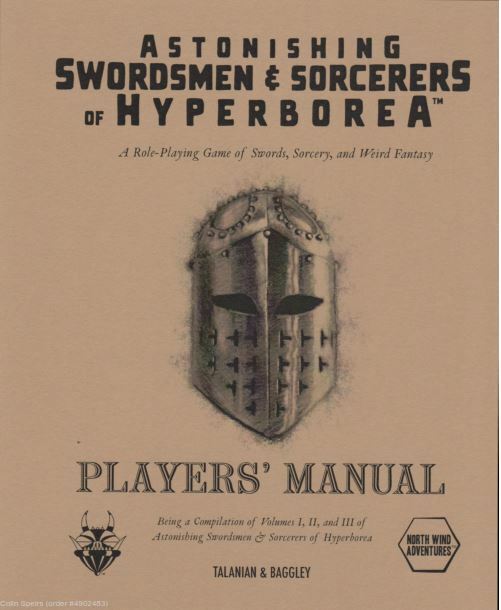 They had produced their own manuscript (Chevalier) for an “advanced D&D”. This would reform the game to have a definite place, a feudal society patterned after that of England and France, it would have a more realistic combat system, mages would be students of esoteric lore, rather than support weapon teams and clerics would be part of a functioning religious structure. They took this to Gencon in 1977 to try to sell to TSR. They saw Gary Gygax berate a TSR staffer and, in their words, looked at each other and said “not to that guy!”. 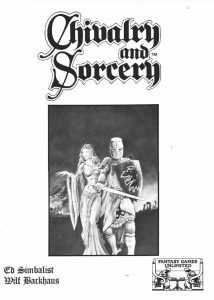 They ended up selling it to Scott Bizar of Fantasy Games Unlimited, changed the rules away from D&D, renamed it “Chivalry and Sorcery” and a classic was born. This had everything. Character generation included hobbits and more Tolkien-like elves and dwarves, but you could also play as a monster, orc, vampire or the like. Chivalry and Sorcery included everything. Sets of pre-generated NPG and Monsters over a range of levels. Goblins need not be stuck at level one, dumb targets any more. A range of mage types, some of whom made better NPCs than PCs, Secret Magical Societies. An essay on Feudal economics, essays on Gamesmastering, an entire figure wargame, it was all here, photo-reduced so that 4 typed pages became one eye wrenching page of tiny text. It was more complex than D&D, combat and magic had so many more options, but it also had more depth. It wasn’t as gonzo as D&D, which may be a matter of taste, and it was such an eye-opener on what RPGS could be, that I didn’t play D&D for over 30 years, missing out on AD&D2, D&D3, D&D3.5 and D&D4. Chivalry and Sorcery served me well, the base settings was expanded with other cultures, including intelligent dinosaurs and crocodile descended people in their on “Lost World”, other facets of medieval life, essays on world creation and games-mastering and the siege game for all society, “Drop the Rock”. And all in text that you could actually read with the unaided human eye. The system had changed slightly, particularly combat which allowed for a D20 alternative to percentile dice , but the first major shock was in character generation.C&S 2 characters did not have the completely random draw from life that C&S 1st characters had. You could design your characters using a point cost system, though you did have a random number of points to buy things with. And characters had always started off at a random age, but irrespective of age they were level one, assumed to be the same in skill and experience. No longer. Now we had a system of previous experience based on age (pro-rating) It was complex, as you calculated the experience points you would have gained prior to play, but here was the thing, you used those points to buy skills. Previous experience was not a new idea, Rune Quest,Traveller and DragonQuest all had them, but in a class and level system? The whole point was you had levels. That was your experience. Your previous experience of live was encapsulated by being level one and not level zero. As for buying skills? Skills previously had been class limited, thieves thieved, knight could use the good weapons and armour and foresters knew when the deer were to hunt. Now characters could buy skills outside their “class”, you could create your fighter with a few spells or thief skills, or a mage who knew one end of a sword from another. They were unlikely to be as good as a specialist, and have their fall range of class skills, but you could have them. My necromancer of Royal birth had the skills at arms expected of a knight, the flip side was that his magical researches went not as advanced as they should have been. C&S stepping away from class and level would continue in 3rd and Rebirth/4th editions, which are more skill based, but Class (Vocations) still matter for the ease with which some skills are learned over others. This is why I subtitled this as a missed opportunity. You had a strong lineage of a game, well known, if usually as a game people used as a research tool rather than played, revamped as a more responsive character system. Where it did not take off is probably in part due to the reputation for complexity that was still deserved by this second edition. Comparison of text size of C&S 1st and 2nd editions. The 2nd edition size isn’t that much bigger, but it is bigger enough to make a difference! Both combat and magic are still involved. This was a deliberate design decision (the player was expected, for example, to be an expert in how spells their character had worked in the system, as almost a live role-playing equivalent of the complexity the character had to go through to shape natural forces. So much so that looking up the rule-book for spell details was forbidden to players of mage characters! This is a definite illustration of the 70s and 80s idea that modelling realism required options and control, but with the downside that events that would have been fast in “real life” took a really long time to work through. C&S was not alone in this, many games of the time had that flaw. There are other oddities too. In a Class and level game like D&D, hit points go up with levels as an abstraction of increased defensive skill in a game without defensive skills. C&S has defensive skills, parry, block and dodge, that increase with the experience of the character, so it is a bit silly that Body Points increase with level. I assume a hold over from “Chevalier”. I loved that you could still play as a monster or stereotypically “evil race” such as goblin or troll, that Monastic Fighting Orders were there to explain “Paladins” but I missed the weird esoteric Magical Orders that Mages had had in C&S 1st, long before Ars Magica. So, what would I like to have seen Ed and Wilf do to nudge it over into perfect. Expand the skills system into a true skill system, use the experience to measure level progression, but also buy skills with that XP, rather than have automatic skill progression in the vocation. Categorise them by vocation so that you can apply penalties for other vocations learning, but let anyone learn anything. Do away with some of the derived stats like PCF, make them weapons skills purely. Simplify combat a bit, using the weapon weight/bulk as a factor versus the Strength or Dex of the character to see how many blows they get in. C&S Essence does that sort of thing. Magic would also be a skill but, given my own experience with Essence, I am not sure I can capture what the guys were trying to do with a much simpler system, but I keep on trying. I recently played a revamped version of RuneQuest 2, one of the other popular non D&D games at the time, and one well regarded for its combat system. That built in the concrpts of the relative speed of characters and weapon, of the potential deadliness of combat, and having been influenced, like C&S, by author experiences with the Society for Creative Anachronism. However I think that time softens the memories somewhat. While combat can be faster if you get some solid hits in, it can also be a long slog, which is actually also true of D&D and C&S. Both those games can have combat speeded up in a number of methods, and C&S has one of those methods, the Critical Hit, as an option. Use that and the combat becomes faster and more deadly. Mages should still steer clear of a fight though. Chivalry and Sorcery 2nd edition is a good RPG, suffering a bit by its reputation deriving from the 1st edition, and needing a bit more time and care to tweak it. It shows why it engendered so much love that when Steve Turner and Ed Simbalist decided to create 4th edition, they chose 2nd edition as the model, not the extraordinary 1st edition or the more closely related, in terms of system, 3rd. It is the edition of C&S I turn to when I want to try and capture the flavour of C&S in something I’m writing. It’s the edition I most used when running a play by email game and I so, so need to get a game of this again! Dammit! Pawr-ambrith looked around the campsite at the wagon guards that were now his comrades. He was the only elf here, possibly the only elf in the Eastern Kingdom, and he knew that elfs were feared as sorcerors and bringers of bad luck. He sat down on the tail of the wagon to eat the stew he had just been served when he saw Webdav lumber into view. The hulking man had made no secret of his disdain for the elf, and it looked like now was his time to make his move. Webdav walked past Pawr-ambrith as if he was going to get his own supper before swinging wildly, a rock in his hand. if he had connected then the elf’s brains would be have been splattered across the wagon, but the elf slipped under the swing and aimed a kick at the side of the brute’s knee. 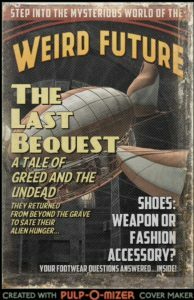 Webdav roared and reached for his club, Pawr-amrith stepped back warily,surreptitiously moving his hand to the hillt of his knife when a look of insight came to Webdav. The huge man pointed at Pawr-ambrith and roard “NO! Not going to happen to me”. “You. You are a protagonist! I know how this works out. You beat me somehow with your tricksy elf ways. Then one of two things happen. “Either the wagon master throws me out. I join your secret enemies and later with them and the servants of the Chaos God and attack you. You brutally slaughter me after some badinage. “Or, having being beaten by you I gain respect for you and become your friend. Later, when you are being attacked by the servants of the same Chaos God I save your life and, after a few noble or perhaps self-deprecating words, I still die! Having said his piece, Webdav stumped over to get his supper and moved to the other side fo the capfire from Pawr-ambrith. Pawr-ambrith gave the others a smile but, inwardly he seethed. he would never become a hero of a forumulaic fantasy novel at this rate! 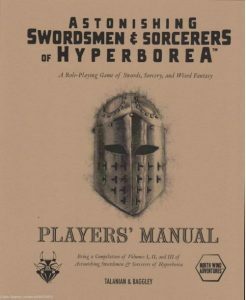 Astonishing Swordsmen and Sorcerors of Hyberborea (ASSH) is a fantasy and horror role-playing game set in a world combining the feel of Robert E. Howard’s Hyborean Age with the pulp horror of HP Lovecraft and Clark Ashton Smith, which is fair enough as that is what Robert E. Howard did. 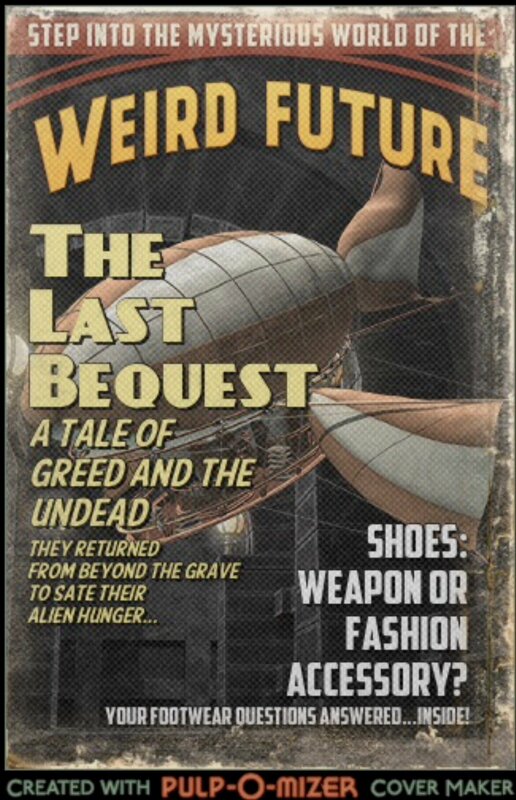 It can be set in any campaign but the default setting is kind of a far future, Dying Earth exhausted world with bits of Moorcock and others thrown in. 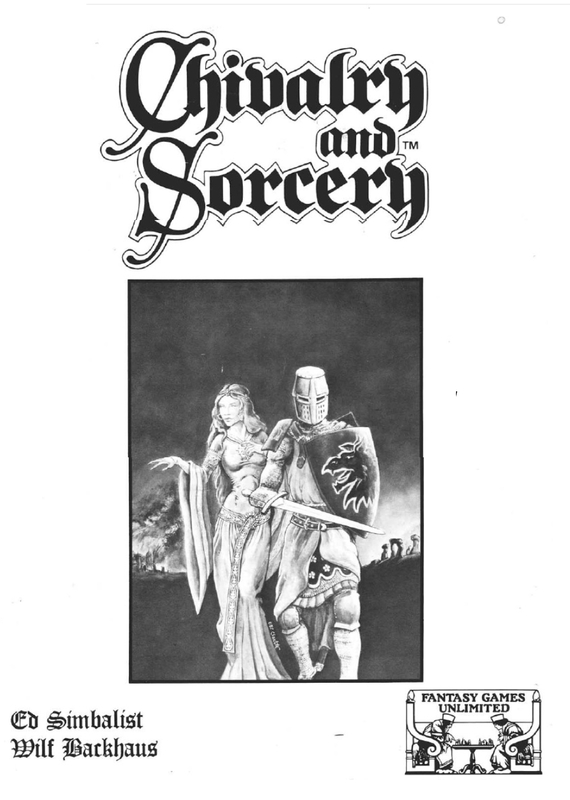 It is a “old school” class and level RPG, being modelled after original and Advanced D&D, in both system and book design, but much cleaned up and streamlined, with nice, clear text and better illustrations than the originals tended to have. 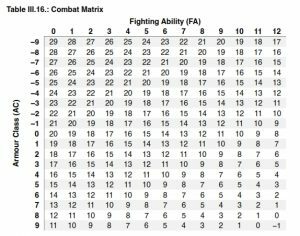 The combat matrix here, though it looks like one of the tables for Class combat in the old AD&D, works for all classes in a unified table. ASSH has four main character classes, the usual fighter/magic user/cleric/thief selection, with subclasses for each which are either specialist forms (eg the Illusionist for magic users), or combinations of classes, such as the Warlock fighter subclass who can use magic). 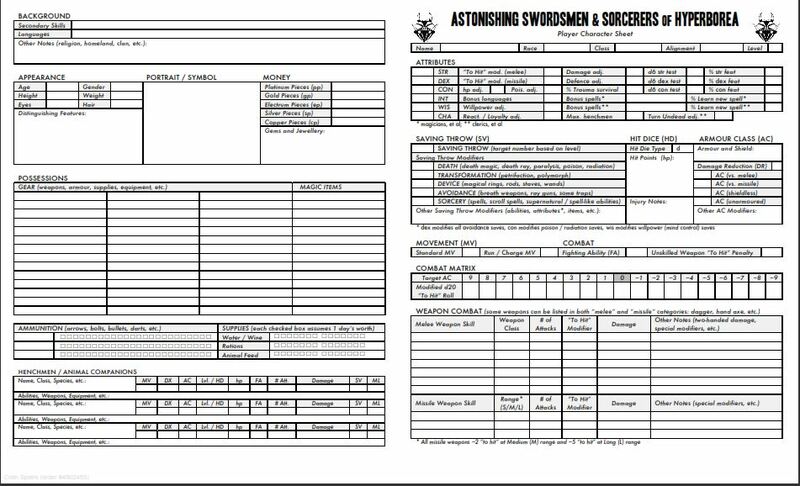 The ASSH character sheet looks a bit daunting at first, but generating a character is easy and as you do so some of the apparent complexity of the sheet becomes clear. For example the two row table in the middle of the right hand side. Is just your characters chance to hit the various armour classes at your current level. You do not have to consult the chart in the book. It is typical that my first play of this 1st edition is as the second edition has not long finished its Kickstarter. I am not going to write up the adventure, because it is a commercial adventure, but I want to write about the experience. It is not really a review of the game, but there will be a bit of reviewing going on. 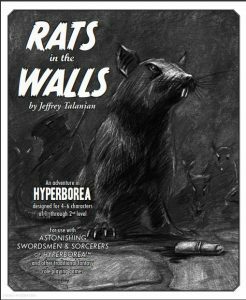 I ran the adventure “Rats in the Walls” which is for 4 to 6 1st level characters. As the title suggests, the adventure involves rodents. This is the first near straight Dungeon crawl I have run in thirty years and it was a fun return to the past. The first thing you notice is that there is far less that your character is seemingly able to do. There is no shared skill system which any character can tap into, but instead limited skills for each class, Thieves having the most, but any half-decent DM can fudge uncovered skill areas. Want to jump from the balcony to the top of the tent, roll under your Dex minus 4. The second thing you notice is how fragile 1st level characters are. Yes, as D&D is still a thing, now in its 5th edition, this will not be a surprise to D&D players but as someone who has played other games for the last 34 years the fragility is astounding. One decent, normal hit from a weapon will kill a character. This is why I had each player start with two characters, in case the first one died. I said that this was a near straight Dungeon crawl, the adventure has two main acts. The first one allows for role-playing and investigation. I confess to a bit of silliness as the innkeeper started off his involvement by intercepting an old man who was moving to the characters’ table and throwing him out before he could give them a quest. Reactions during play were fun. Magic users getting used to the idea that they do not have power or magic points that regenerate. At level one they can cast one spell a day, more if they have high intelligence, from their stock of three spells that they start the game with. Combat was quick, as, at least at first level, a decent hit from a normal weapon will kill any but the luckiest character. It might grind at higher levels but, of course, fighters get more attacks per round at higher levels and the squad heavy weapons team, sorry magicians ;), will have more powerful spells. Here is a good example of ASSH’s streamlining. Rather than an effect based on some formula, the ability of characters to fight/cast magic is given in terms of Fighting Ability/Casting Ability. Fighting Ability is the marker of skill from which you can check your chance to hit. Casting Ability is the number of spells you can cast and can affect the power of a spell. The class level table shows that for each level. For specialists the Ability equals the level but for others the progression is slower. 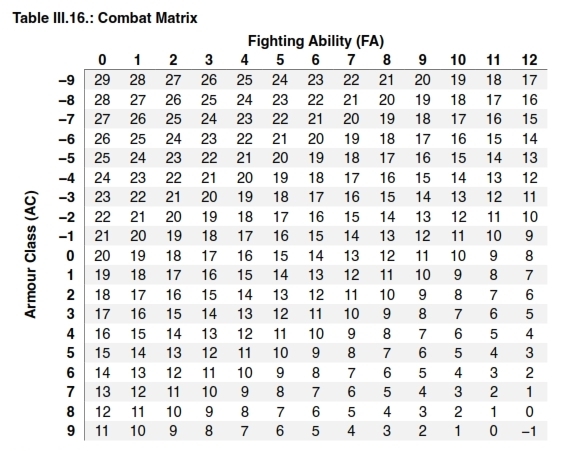 A 5th level Paladin (fighter sub-class) at level 5 has a fighting ability of 5. A 5th level Necromancer has a casting ability of 5 but their fighting ability is only 2. That Paladin can cast magic, but not until level 7 and then only at Casting Ability 1. Similarly both Necromancers and Paladins can Turn Undead(*) but less effectively than Clerics. 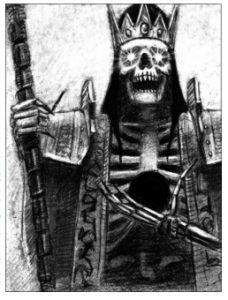 (*)My wife has always felt that Turn Undead should be just that, become a skeleton, ghoul, lich whatever. One thing that took me by surprise, but maybe should not have since we are not a dungeoneering group usually, was the lack of the old habits I remember from when I was a kid. Checking any wall, floor or altar for traps, secret doors or hidden features. Thinking back it is amazing that more monsters aren’t alerted by the sound of ten foot poles banging off every surface as the party advance along the corridor. Neither was there scrabbling around looking for precious monetary treasure, for as we know, what does GP equal, that’s right, XP. Tasty, tasty experience points. ASSH also gives awards for clever ideas as well as slaugtering foes and stealing their stuff, which I think is always a good idea. I do have a few niggles. Firstly with the adventure. 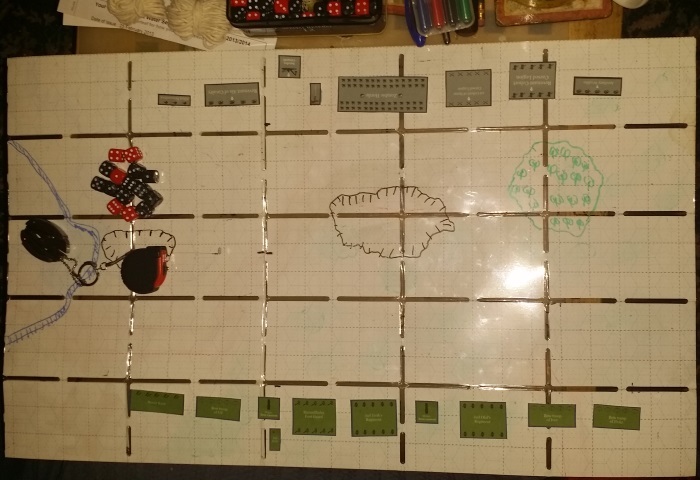 The maps for the building interiors are tiny, squashed into the page count, but around a table top that might not mater so much, using Roll 20 as we were, cutting and pasting from the PDF did not make for good resolution maps. The only other niggle is the spell list. Rather than be listed by class or by level they are listed alphabetically. I think having them split by level and then alphabetically would make things easier to find. This is a minor thing, though having the physical books, as always. is preferable to working just with PDF. This is one I investigated having professionally printed and bound before I was lucky enough to get a boxed set. The only reason I did not buy a boxed set was that it was only available in the US and then you risk a hefty import duty for a boxed game. Right. Now to prepare for next week’s game, more dark dealings in Hyperborea! Warning. This is a write up of “Uncle Timothy’s Will” in Blood Brothers. If playing that then stop reading. I have made changes to details. In episode one we met cousins Joan Hildyson and Sigismund Krankenhofer and detective turned novelist Francis Fitzcarraldo who were attending the reading of the will of Timothy Hildyson, Uncle to the cousins and a former employer of Francis’s. Panting and panicked by the attack of the dead, our trio start stacking books on the floor intending to wrench the bookshelves off the wall and block the window again, hoping to fort up until Monday and they can claim the inheritance from Uncle Timothy. However the discussion turned to being more active, rather than waiting to die. Where might be safer, the attic? Either that would be a safer place to hide or they might find the secret of what on earth is going on. Up to the first floor (second floor to Americans) and to look for the way to the attic and the group is met by Jamison. The group had instructed him to walk 12 miles to fetch help but he had said he would go in the morning and it is not yet daylight. The door however, did not. It was a linen cupboard, turning in surprise they say that Jamison was being joined by the other three inheritors, Joan’s cousins, all unconscious but with a murderous cast about the way the drool dripped from their gaping mouths. Francis shrieked and shut himself in the cupboard. Joan and Sigismund sighed and prepare to defend themselves. Cousin Henry rushed Joan, but she skipped aside, raising the poker high, and Henry tripped at the head of the stairs and rushed into the wall of the half landing, breaking his neck. Sigismund drew a heavy annotated copy of Freud’s “Die Traumdeutung” and slapped Cousin Sydney the doctor with it, the blow hit heavily, snapping his neck instantly. The rolls of the players were incredible. We found out why soon after this. If you have default skills in Roll 20 but have not actually filled in the space for the skill level, then the roll will come up as “1” every time. We let these rolls stand for this but made sure we did it properly thereafter. A slash with Jamison’s neck by Joan’s poker crushed his windpipe, while Sigismund grappled with the last remaining cousin, throwing her down the stairs to slump in a heap. Francis looked out of the cupboard and, seeing it was safe, came out of the closet. They wanted to interrogate Jamison but death made that impossible. The bodies were twitching, and they knew that they would rise soon. Francis stuck the shotgun under Jamison’s chin and fired. The shotgun, which had not been cleaned since before the war, blew up in Francis’s hands, taking a finger from his left hand. The way downstairs were blocked by twitching and rising corpses, so the trio, thinking something useful might be in the butler’s room, dashed in there and blocked the door. After patching up Francis with bandages made from sheets and Sigismund’s long ago medical training, they conducted a hasty search of the room and chimney finding a gold $5 coin in among the soot and a notebook under the bed. The notebook had two phrases written over and over again, starting neatly and getting more and more deranged until the last few pages are written in what looks like dried blood. They were trapped in a room with scrabbling at the door, but Sigismund, remembering tales from his Uncle Joachim who served in South Africa with the Natal Police, told on an event in a church station where the soldiers dug through the walls to escape through another room. These walls, of wood and plaster were much easier to get through. By luck, the next room also contained a trapdoor in the ceiling to the attic, and the trio were able, at last to reach their goal. The attic did not contain any occult horror, however, just dust, boxes and some ropes, obviously intended for a pulley fixed above one of the windows. The way downstairs was blocked, reaching hands were waiting under the trapdoor. The rope provided escape through the window, down to the doors to the cellar, obviously the pulley was situated so that things could be easily transferred between cellar and attic without going through the house. 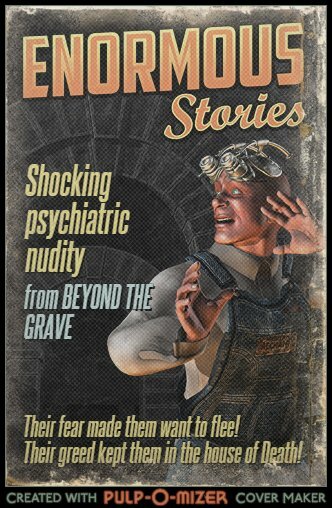 The cellar doors opened into a closed off part of the basement, some sort of workshop with discarded tools and copper tubing and a journal.That journal revealed that Uncle Timothy had plans, plans that involved the drugging and subverting of the will of his butler and maid and the sacrifice of his relatives. The bloodbath happening upstairs had been predicted in his journal, though what had happened did not fit with Uncle’s plans, and he intended to come back and at they realised that no one could remember a funeral for Uncle Timothy, or even news of the body. The journal also led them to a stack of banknotes. Not the million dollars promised in the will, but obviously what the resurrected Timothy planned to use to start a new life, well away from the horrors the authorities would discover. Francis’s keen investigator’s mind tied the copper tubing to the lines scribbled by Jamieson, “The Master’s brew!”. There used to be a brewhouse in the grounds, back when the family brewed their own beer, and made their own tinctures and decoctions for medical reasons. After setting a fire in the basement to destroy the walking dead upstairs, Joan and Sigismund led Francis to the tarpaulin covered ruin of the brewhouse, secreted in the woods to the north of the house. The ground floor was bare but the stairs had been cleared and the stairs had recently been used. Only Francis dared to go down, and was confronted by strange apparatus surrounding a vat from which rose an abhorrent smell, as if stale chipfat, rancid and overused, was emanating from a chippie renowned for poisoning its clients. Something came over him though, and he invited the others to come down and see the wondrous jewels and precious things. 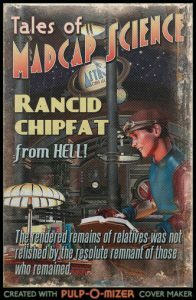 The others resisted his blandishments, and fearing for tangling with a deranged Francis or coming under the spell of Uncle Timothy, they started to chuck rubble and flammable material down the stairs. The first burning torch singed Francis, snapping him out of his stupor and he dashed out. His panting incoherent form almost earned a poker to the skull but he managed to persuade Joan to spare him and he helped complete the task. The stench was almost overpowering,but the three walked away, the flames behind him, as a psychic scream ripped through them like a wall of force and vanished. Uncle Timothy, the thing he had become the rendered blob that he had hoped to rise from, had gone. They got in Francis’s car, split the funds and drove off, hoping to be far, far away before anyone came to see the twin fires. They had survived. 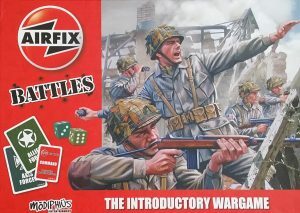 Better known to modellers and gamers from the British Isles, Airfix have produced military model kits, terrain and figures since the 1950s, being an integral part of the childhood for many British children and their first introduction to playing with toy soldiers. Their 1/72 (closer to 1/76) scale figures have been a cheap entry way into wargaming, though they need a a bit of prep before painting, and in the 70s they published sets of wargames rules and guides. So iconic were they that there was even a video game where you could fly Airfix model planes through household scenes, battling other planes, tanks and looking for pickups. 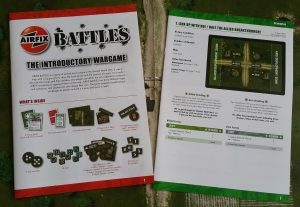 Now Modiphius, better known for their role-playing games, have issued the “Airfix Battles:Introductory Wargame” as their first published boardgame.This is a platoon level skirmish wargame for World War 2. 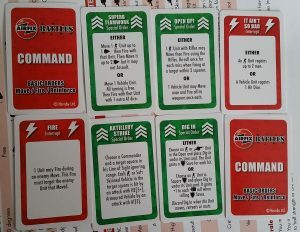 The game has vehicles and small towed guns, but air support and heavy artillery is off-board and triggered by playing a command card. 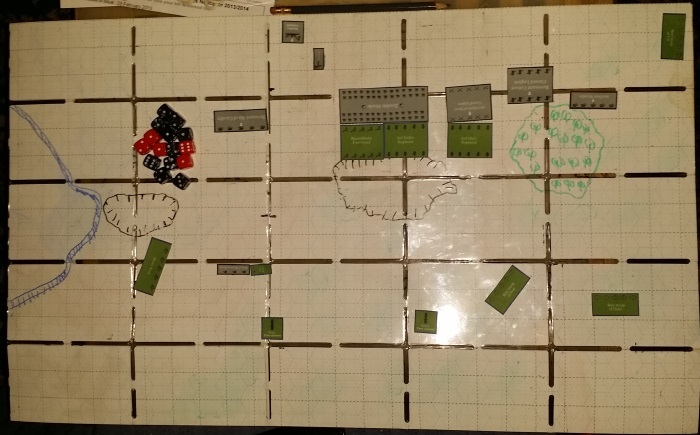 In the box you find a book of rules, a book of scenarios, two double sided, interlocking map sheets, three sheets of counters with terrain, troops, vehicles and markers, a bag of ten (five olive drab, five feldgrau) six-sided dice and two packs of cards. 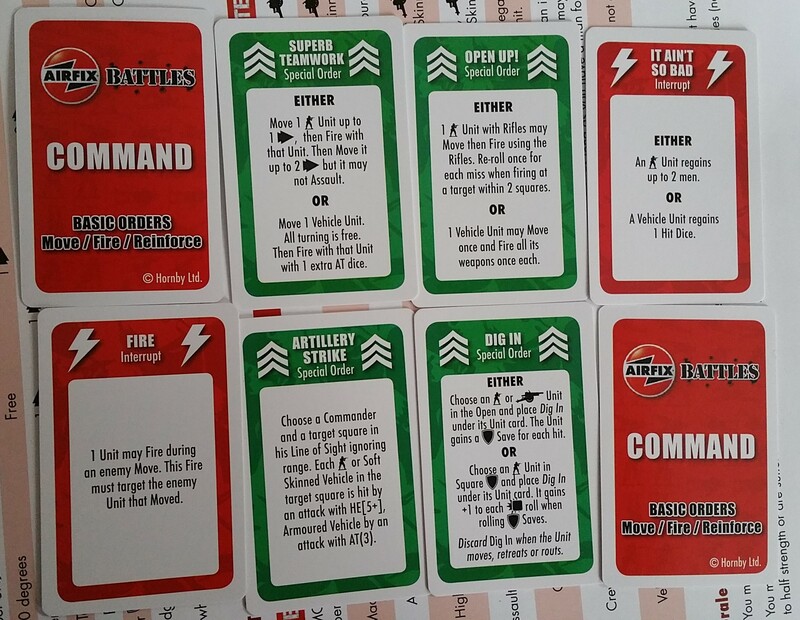 One pack are unit cards for Americans and Germans, the other are order cards as the game is command card driven. The rules are not long, and aim to start the novice right into it with an introductory battle with each side having a Captain with a group of veterans, and two sections (squads, gruppe) of basic infantry. 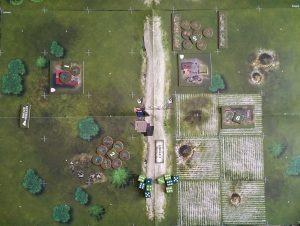 Each side starts at the short end of their side of the map and attempts to kill the other, keeping the learning experience simple with orders, movement, terrain effects, combat and cover. Each soldier has their own figure, a cardboard counter in the case of the set though obviously Airfix hope you might go out and actually buy some of the real things. There is a slight reference made to multiple figure bases, but no game is mentioned, but you could, in theory, use Flames of War or Crossfire bases with this, as well as single figures for games like Rapid Fire. 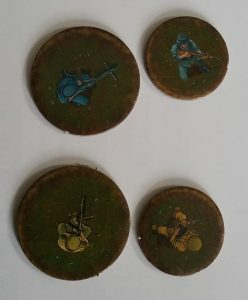 The troop counters have a sort of shellburst icon on the reverse and you can use them as wound markers for based units, so you do not need the 1 figure = 1 troops on based figures. The map is separated into squares and all movement and ranges use these squares without diagonals, so a square next to your unit diagonally is two squares away, not one. How many cards you can have in a hand, and how many you can play in a turn depends on the quality of your commander, in the basic game you have five in your hand and can play two. The good thing is that each card is double sided, with the back of each card is a standard order, you can Move OR Fire OR Reinforce (if available), but the face side is something special, and often give you two options. This means that, unlike some card driven wargames, you are never stuck with no chance to use your units, waiting for your card to come up in the deck. Once you have had a couple of turns to get used to the mechanics, the rules are fast and brutal. Troops caught out in the open, not even dug in will be massacred, you only get a save if in cover, and losing troops reduces your firepower. You have limited command and control, in the introductory example you have three units but can only issue two orders per turn, so you still have to think about what you do. There are cards to interrupt your opponents action or to issue one use “buffs” to improve your units performance, but otherwise the turn sequence is “roll for initiative and each side issues and order for as long as they have not spent their play limit”. American captain with attached veterans and a Sherman. The numbered chits are used to show which unit on the board they represent. A similar chit is on the unit. The captain shows his “play two and hold four” command capability on the right of the picture. The dice and figure silhouette on the left of the picture tells you he hits or saves on a 4+ and has a move of two squares. The stars on the top right are the point cost. The icons on the bottom right of the captain explain the units he can command. The one without the band is compulsory, the others are optional. The veterans in the centre are purple which means they have to be attached to a leader, in this care the Captain. 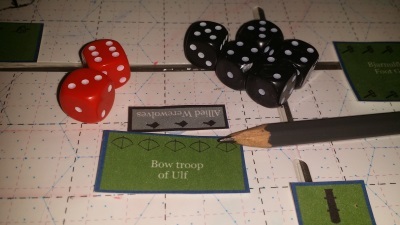 The use of unit cards means that special rules relevant to that unit is on the card right there, for example the veterans above reroll misses against adjacent squares or American Infantry squads get an extra dice against enemy infantry because of the firepower they can bring to bear. The game is definitely more on the “game” side of the game/simulationist debate, and is intended for fun, for example there is a “valour” counter, initially given to the person who lost initiative, giving one free reroll can be used then passed to your opponent, to help counter rotten luck. Since it is an introductory wargame, the basic rules are introduced in the first scenario as needed as itgoes through the steps of the turn. This works well and without them being awkward to find once you are playing different scenarios. The some of the additional scenarios in the scenario book introduce other rules, so you get to learn them step by step and there is a point system so you can build your own forces. 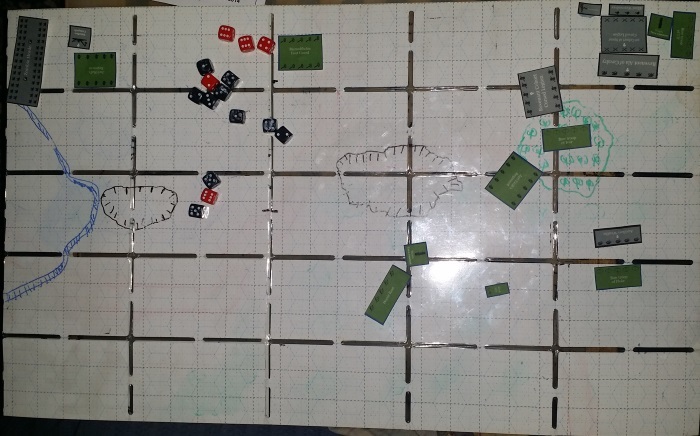 It is more of a boardgame in some ways than a figure wargame, but I have seen other square based games, such as the ancients game Lost Battles, being played with figures on a normal wargames table quite successfully. The components are of good quality. The counters are thick and pop out easily from the card sheet. The maps are have the squares marked at the corners rather than ruled lines and have a dot in the centre to make them clear without being too obvious. The unit cards have the lovely Airfix art. This is a spectacularly quick, and tremendously fun game but is still tactical and rewards paying attention to your units and not doing stupid things with them. There is a lot of thought into making it clear and consistent, right down to both the rules and scenarios book having a copy of the movement and weapons tables on the back page. Each unit has a different flavour thanks to the unit card so you get a good amount of variety. 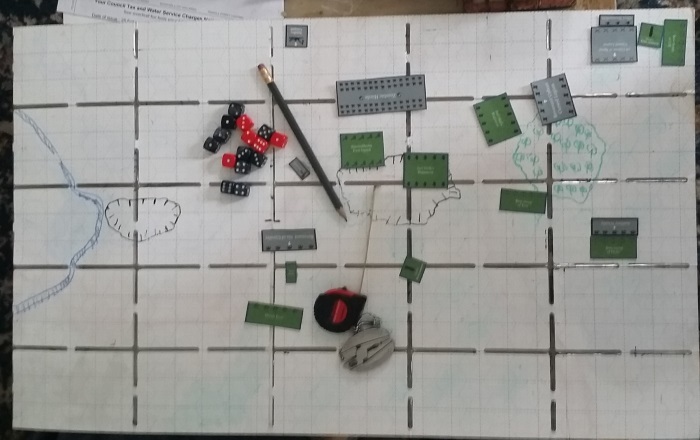 It is an introductory game, and it does introduce concepts like opportunity fire, cover, morale and pinning units, tanks having weaker armour on the sides and rear. It even has a programmed section for managing enemy behaviour when playing solo games. My only criticism is that the illustrations on the troop counters are a bit dark, making it a bit hard to distinguish at a distance, though closer to the dark blue-grey Germans are easily distinguishable from the olive drab GIs and the counters are generic, rather than having the full range of poses from the figures. Then again, they want you to buy the figures. The other issue is for long term play if you don’t want to get into the figures and vehicles, there is no sign that Modiphius will produce countersheets for the new forces they will add to the boxed set. I suspect that there may be new boxed sets for other theatres of war, if so then they may have relevant counters. 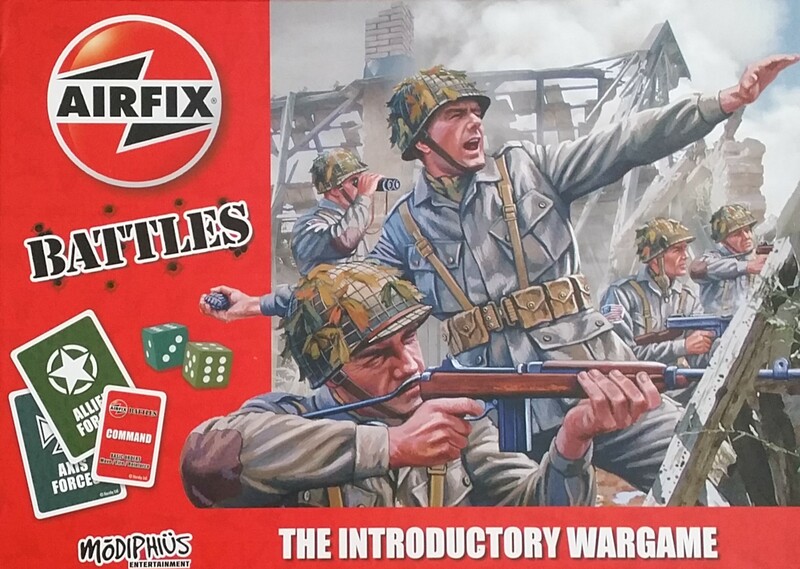 Airfix Battles is out now and costs £24.99. There is also a bonus pack of 24 unit cards available for £4.99 expanding the Germans and introducing the British. There are expansions planned and a collectors edition that expands on the base rules and expansions but aiming at proper tabletop wargaming so it will not have maps . The rules can be obtained for free from Drivethrurpg so you can read them for yourself here. He was a distant cousin of Joan Hildyson, journalist, and an even more distant cousin and some rumoured real father of Doktor Sigismund von Krankenhoffer. For detective turned writer Francis Fitzcarraldo he was a former client and later patron. These three and three others gathered in Timothy’s house on a lonely hill in the backwoods of Vermont on a wet Friday night. After being served dinner by butler Jamison and the maid Henrietta, they are addressed by Hildyson’s lawyer Charles Turner. He was asked about this odd proviso and replied that, in his opinion, Timothy was used to using the power his money gave him to force people to do his bidding and this was one last exercise of power. Francis, being familiar with both Timothy as an employer and with Charles as Timothy’s agent felt this to sound like the old man. With that he sits down and Joan orders drinks. Despite Prohibition, gin and brandy are found. The three others, Sidney the doctor, Harvey the lawyer and Mindy Elizabeth the writer/political radical soon retired to bed, followed by the staff. Eventually even Sigismund admitted defeat and retired to bed upstairs, the bedrooms for Joan and Francis were on the ground floor. A loud thump alerted the other two who rushed upstairs to find Sigismund on the ground having slipped in a pool of blood. A trail led to a bedroom door, Joan bravely went in as Francis and Sigismund cowered behind her. There she saw Charles Turner splayed in death on the bed, his guts opened up and lungs thrown down. Even to a hardened beat reporter like Joan that was some sight, and she had to get away to compose herself, away from any other people. Francis stepped in and steeled hmself against a sight he had no seen since the trenches, but the blood unnerved Sigismund, he ran from the room to his bedroom, stripping off his bloodied clothes as he did so, panting in his room as he got it back together and dressed in clean clothes. Francis examined the scene more closely, noting small footprints in the blood and that the heart seemed to have been removed from the corpse, the rest of the offal having been discarded. Most went back to bed, locking their bedrooms behind them, ready to discuss this in the morning. Our Investigators did not, Joan searched Charles’s room more thoroughly while Sigismund and Francis followed the blood trail and looked in the Library for any sign of correspondence from Timothy that might lead to why someone could be aiming to kill his heirs. While Joan found that Charles wasn’t an heir like them, having a fixed bequest as a fee for his work, the men found that the blood trail ran out beyond the back door, washed away by the rain. In the Library they found some mildly interesting family history and a rather disturbing copied bit of text from an anthropology work about Australian Aboriginal shaman beliefs about the soul. That research was disturbed by a commotion upstairs. Meanwhile Joan heard a sound behind her, to see Henrietta bearing a tray with a glass of gin on it which she offered to Joan. As Joan considered this Henrietta threw the tray at Joan’s head, but missed. Henrietta’s follow up charge was countered by Joan barreling into her and shoving her into the door, stunning her momentarily. As the men arrive up stairs they see Joan thwacking Henrietta on the head with a sturdy shoe. Charles’s body is covered with clean sheets and the unconscious Henrietta is placed on her own bed and locked in. The three decided to fort up in the library. They have Jamison bring in food, a commode and a screen and say they will leave the house to fetch the police in the morning. Jamison gently reminds them that they cannot leave the house lest they forfeit their share. Greed lit up their eyes and they tell Jamison to go himself. He mentions that he cannot drive so it will be a long walk, but he will go. Fatigue and alcohol take their toll, Francis and Joan fall asleep, though Sigismund, not having drunk as much perhaps, stays awake with his thoughts. He is surprised to see Charles Turner’s corpse and an unconscious Henrietta burst through the window, Charles grappling with Sigismund, trying to grapple him down, though Henrietta fails to launch a crippling blow. The others awake, Joan picking up a chair and smashing Henrietta sideways against a bookshelf, cracking ribs and splitting her head open and it is obvious that Henrietta is dead. Francis grabs a dusty old shotgun from the wall and slams the but into Charles and Sigismund picks himself up. The now dead Henrietta rises up and lurches towards Joan, who, picking up a fire iron, slices into Henrietta's head and lays her low. I have been thinking a fair bit about what I want from games, This appllies mainly to RPG, wargames and boardgames, which intersect in my thoughts and what I perceive as why me and current trends don’t seem to be meeting. This is purely personal, your own experience is no doubt different, possibly more satisfying. To give a bit of background I played in a few, long term RPG campaigns in my time, seeing characters grow and develop. In some campaigns even having some effect on the world. Similarly with board games, we got a game, we played it a lot, tried different things, tried the variations, talked about it. These were mainly board wargames, as opposed to the currect boardgame revival types. Although there were a few abstract, most would class more as Amertitrash than Euro style. New publishing methods, new funding methods, new delivery methods mean that RPGs, figure wargames and boardgames are arriving at a high rate. Crowdfunding seems to be working, as there are not enough failures yet to spoil that as a method of providing finance, as opposed to taking on that fifth mortgage or offering the bank manager sexual favours in exchange for a loan extension. So, the first niggle is this. Depth of play. Not in terms of play depth, but in getting enough time to explore that before moving onto the next thing. I saw that a bit at my favourite wargames club. A new wargame with attendant figures would come out. Those with skill would have the figures painted quickly and played with long before I was ready, and they would move onto the next game. Figures can be repurposed, well, often, but you can’t do that with board games so much, but the same is happening. The games, whether RPGs or boardgames, are not getting those exended games. Characters are not developing in their game world. Options and strategies are not being explored, one off games are happening then the next new game is brought out. The next niggle is this. Games as a social event. Euro games in particular might as well have you playing on your own. You make sets of things whether collections of objects, territories or constructed items, and at the end you tally up a score , and then you have a winner, woooooo! There is precious little interaction or through game competition, you might as well be playing in your own house and postin the results on a forum. Although you can stymie an opponent by closing off a route they want or taking a desired rseource, that usually seems incidental rather than deliberate. Add to that there is the fact that these are a kind of games I do not enjoy much. If I got to play games I enjoyed more in exchange then that’d be fine. Social contract and all that, but that isn’t happening and, as a wise man once said, “if it isn’t fun, stop doing it”. Aha! Coop games I hear you cry! All about the player chatting and decision making. “Pandemic”, “Lord of the Rings” and “Castle Panic” for example? Well, that’s the theory, but too often one player dominates and the others become proxies rather than equals, and we are back to a low quality social experience. So what is “the answer”? Well, there is no universal answer, this is purely personal after all, so this can only be for me. Well, I can play those coop games, I have a few after all, but I might as well play them solo at home. They are designed to be player versus game after all. I can play some of the sort of board games I like solo, randomising strategies, or playing both sides. Figure wargaming I can return to my foldable projects and tting armies painted at a glacial rate to once again play figure wargames. As to role-playing? Do my bit for agitate for longer campaigns, but that;s a group decision. So make my case and pitch it. Might do a bit of random dungeon bashing for old times sake from time to time. If you made it this far, thanks, you must have been stiuck for something to do tonight, seriously, but thank you, good night and may your god go with you! To recap the first post of this battle, a group of Northmen under Jarl Sven of Bjarnulfholm are fighting the ancient evil known as the Cursed Legion, raised from centuries in death by the Nameless Necromancer (basically because I couldn’t think of one when doing the army list). 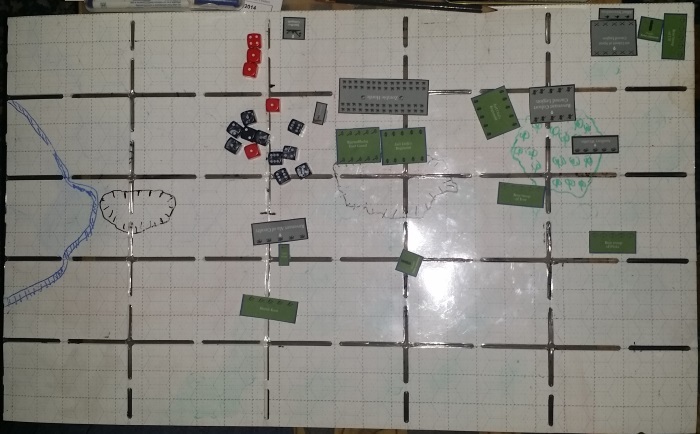 The Undead surprised the humans from the outset, with allied werewolves surging forward and ripping through a unit of archers and overrunning one of the two precious cannons. That part of the game was played at midnight. The rest was played in the dull grey sunlight of a Scottish summer. Let’s see if that makes a difference! The werewolves, flush from their demolition of the cannon Hugin, got overconfident and turned towards its brother Munin, leaving its rear open to a charge from the knights of Hersir Knut. After that charge wiped out the werewolves he turned ready should the Revenant Cavalry overwhelm his lord, the Jarl Sven. Sven assaulted the Revenants, scoring some hits but to no conclusion. The Bjarnulfholm Guard and Jarl Eirik’s troops inflicted heavy casualties on the Zombies, but they held in there despite that. The cannon Munin blasted the Necromancer out of existence. Being able to conquer death didn’t stop shrapnel tearing him apart. Jarl Olaf’s Regiment and the Archers positioned themselves to try and block the other Undead units until reinforcements could arrive. Jarl Sven has survived the onslaught from the Revenant Cavalry. the Zombies inflicted damage, and recruited new members from, The Bjarnulfhom Regiment. That regiment came close to breaking, and it was too far from its Jarl to be able to rally them, but they held steady. Flokr’s Archers were not so resolute. They did not break, but they are now wavering, and wll be unable to prosecute any attack next turn. The Bjornulfholm Regiment overruns the Balefire Catapult, though Jarl Eirik’s Shieldwall might have been better to use. Luckily there were triple rolls for attacking a Warmachine, otherwise it would have been just fine. Flokr’s Archers are wavering so do nothing, as are Olaf’s Regiment, but Ivor’s archers attacked the Revenent Cohort in the flank, but that had no effect. The cannon turns around and Jarl Sven retreats, I mean, sorry, advances to their right wing given the knights free reign against the Revenant Cavalry. They break the Revenants and change facing ready to advance next turn. The Revenant Cohort could counter charge the Archers by turning to face them and attack, which is one of the changes in this version of the rules, but instead they decided to attack the Jarl Olaf’s Shieldwall, which breaks and flees. 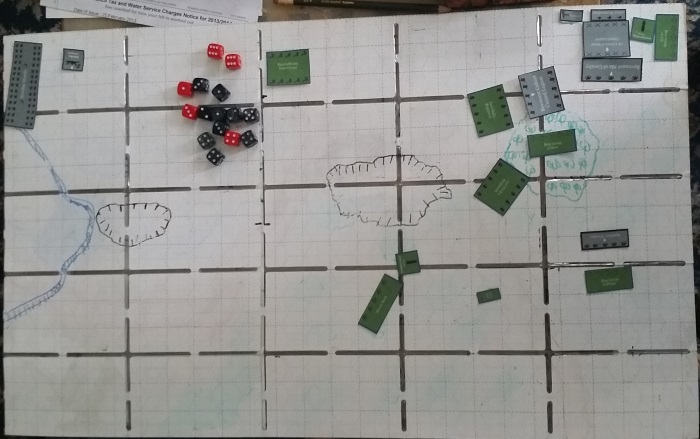 The Wraiths hit the Archers again, but they fail to inflict any damage. The game ended there,. In a large part due to luck going towards the Northmen this time. Usually I only see that many sixes when rolling low indicates a crit. The Revenant Cohort could have held out to the end as noone had it in a charge position. However I had a good sense of how this played and finished up there. As I found yesterday, this is a fast, streamlined game that just lets you get on with your tactics. The different units and races do have some special effects, but the special effects do not overwhelm the game. As it should be, this is about troops getting out there and fighting. Yes a huge blast from a cannon can rip through a unit, but it is not going to blast the whole army and it is very fragile. The mages can shoot lightning, but it is more of a support attack than a battle winning attack on its own. A good point was made by Andrew Bussey of G3, which is the club I would go to if work allowed. With Warhammer there is some “player agency”, in that if your troops have a save roll, then you get to roll in your opponent’s turn. You feel involved. In Kings of War the active player makes all the rolls. So. Do you miss this? I do not think so. Yes, you have the sense of being involved but, in part, that becomes necessary is that a turn in Warhammer can take so long that you need something to do to stay involved. In Kings of War it is so speedy that you get your turn to roll dice and enact your plans in short order. So. I like this. I think I like it more than the last version of WFB I played, which was, I think, 7th edition. I have Humans that I can do but I have the Island of Blood set so would love to use Ratmen, if those get added to the world, and Undead. I had a project a long time ago for a Roman and celtic undead army. It would be great to get that done. Now to try that all werewolf army idea, what will it do?